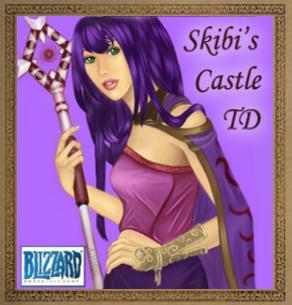 - When starting a maze, build the most fast attacking towers at the back and the strongest at front to kill the "spikes" from the slow ones: mobs which randomly leave with more hp than others. There are 5 Slots for each team of players on the map and on the same time 5 waypoints for each one of them. You can also team up with other people and use one waypoint together. Waypoints are in the white areas on the map. A waypoint means the mobs are forced to run there as a target before they can run to the castle, which means each mob has to run past 3 waypoints which are guarded by players. Red and Purple are the 2 players at front of each side. They got the advantage to be able to kill all the mobs while others have to hope for leaks. Because of that they got the worst waypoints of all- they cant build around them and because of that cant fully use their towers on 200% effectivity as a wall. So the only advantage is, that the mobs run around for an additional time without having a big maze. That way it is more easy to nonleak at start. 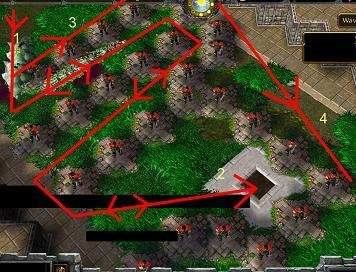 On the picture the Red Line shows the way the mobs are walking. The numbers show which part of the lines you should build first. 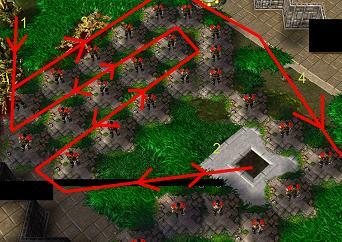 In this tactic you start with a line at to so the mobs have to walk around that to the waipoint. You fill the place with more lines until you hit the center. The more close to the center the better towers you should build, because you do most damage there and reach every place. Yellow and Orange are the second ones receiving mobs, they got the best waypoints for playing alone. 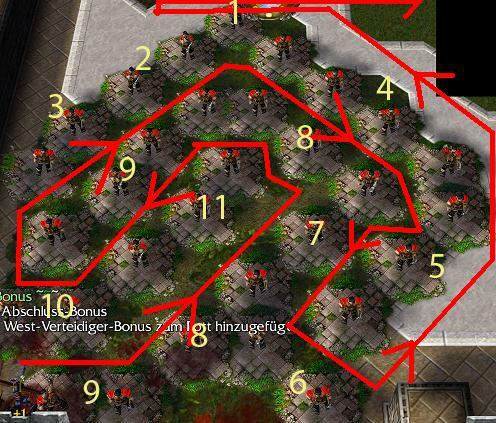 On those waypoints its possible to use all towers at 200% maze-effectivity. But of course its not just that easy to get 200% effectivity. The problem is- the more thin the ways for the mobs are, the higher the chance they will "selfblock" and destroy your towers. Its also possible to create a very big maze at those waypoints at full effectivity, but I wouldnt do that, because your towers will burn and all. The numbers show in which order the mobs are walking the way. 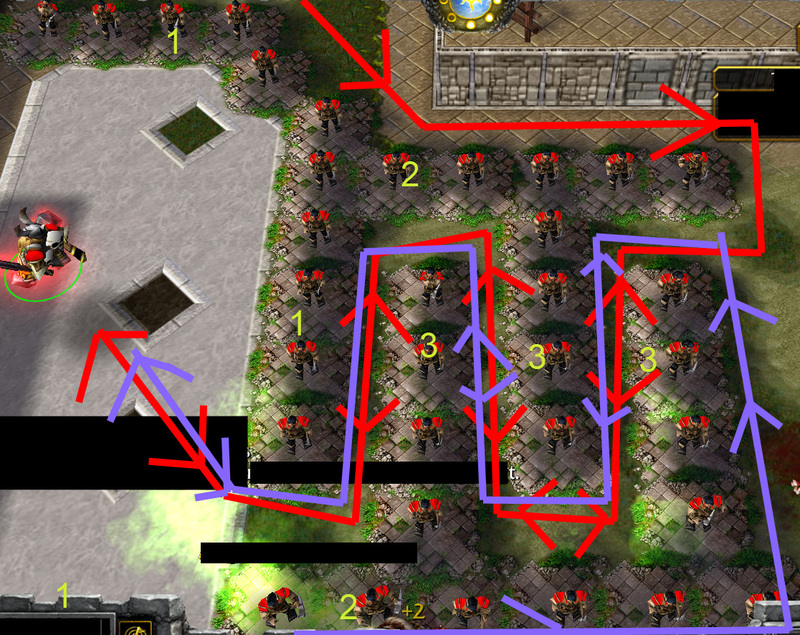 In this tactic you start a wall south of your waypoint while expanding it to the north. The corners are very thin, so mobs will selfblock without killing your towers! Thats pretty helpful and stopping them for a while. 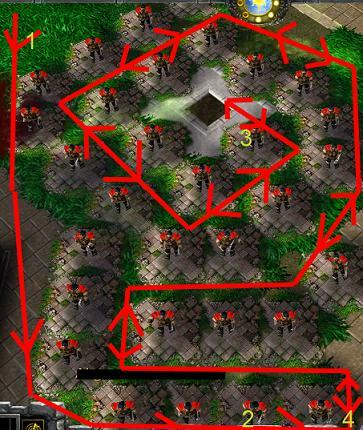 This maze is very safe to not loose towers by "selfblocking" mobs, its about 5% chance depending on your other tactics to actually loose one in 46 waves. The same as the WP-Walls Tactic, but not as much space as there between the walls. Thisone got a little more chance to destroy your buildings, but slows them more and gives your towerdmg more effectivity. In this tactic you start directly at the waypoint and build a circle around it, which gets bigger to the outsides. I can't really remember if this maze was 100% correctly, because I havent played for some time, but the free space on the waypoint should be east. You shouldnt buy the tower at number 3 or at least buy a very cheapone instead, because towers around that place there will definately sometimes be selfblock-killed. If you are grey, you should ask others to team up with you at your place, it is better anyway and you learn new things, because of combinding auras etc. The problem about this waypoint is, that it is too big to directly build around it. If you are teaming up with more than 1 person it is very hard to make everyone do one tactic, so you should just build simple lines if you dont know them well. The characters A-C show which part of the lines you should build first. This tactic is best when you cant directly build many towers; eg when others infront you leak at start. But this tactic is not very effective and front towers could die without good towertypes at right places. The good thing about this tactic is, that you can first build simple walls to protect the castle and then still build thisone. If you are playing alone or the mazes slow them down the same on both sides this is good to slow one side more down than the other, because 1 side has to walk a longer way in your maze. This tactic is good when teamplaying or if others don't leak at start. 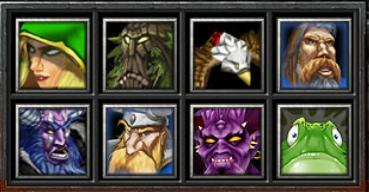 First build complete except one free spot on the east side around your big waypoint (wall 1). 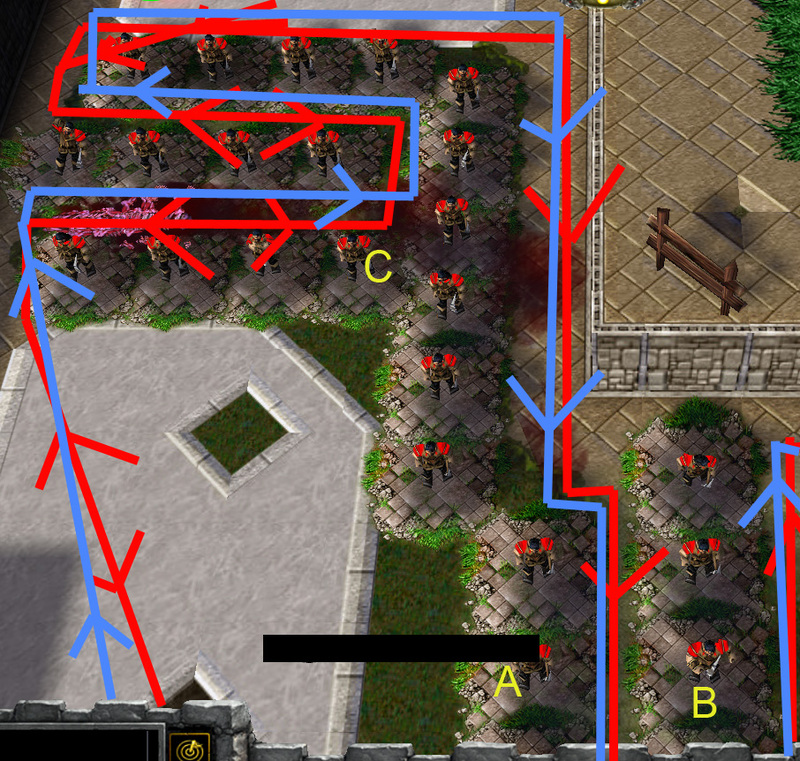 Then expand your maze to the right to let the mobs from both sides walk in and out of your maze. Using this tactic you need to plan a tactic first how to keep the towers around the waypoint safe or just sell and rebuild them at attackingwaves.